Thank god for WordPress reminders and the unstable Earth! Last week I got my last reminder from WordPress to renew my account or lose my lovely URL. That motivated me to re-up for another year, knowing that my last post was Super Bowl XLVII, hmm, in 2013. Did I skip a year….and a half? Oh well. I cleaned out the vegetable bin in the fridge at least four times since then. This morning our western Oregon community experienced a 4.2 magnitude earthquake. I felt it shake my house and heard a sound like a large animal had jumped on the roof, which of course it did not. I did go out and look in case the local wild turkeys had all decided to take refuge on my roof at the same time. That would have been equally noteworthy! So here I am. It’s summer in the Willamette Valley and the 4th of July. Let’s eat! I’m attending two potluck parties this weekend. Plan A is always to take a bottle of wine. I have many to choose from, being a wine hoarder. Plan B is the more creative route. What can I make from the aforementioned vegetable bin? What else is lurking in the fridge. I find a few organic zucchini’s from my friends with the productive new garden and last few slices of a hearty rustic wheat bread. Two potluck dishes are needed. I go to my collection of beautifully illustrated cookbooks and begin to search. I started with Beatrice Peltre’s gorgeous La Tartine Gourmande (2011) cookbook. She has an easy and elegant Zucchini Salad with fresh herbs recipe. I pulled out my large mandoline that does a nice julienne cut for the zukes. The dressing is a simple vinaigrette with the addition of maple syrup (or honey) and some herbs. I used mint and cilantro since those were on hand. I topped off my salad with two baby zukes, one with its blossom still attached. Classy, simple and delicious! Potluck #2 would use up the rustic bread. I dried it out a bit in a warm oven in the early morning. Then realized that the 95-degree+ day would dry the bread just fine, thank you. 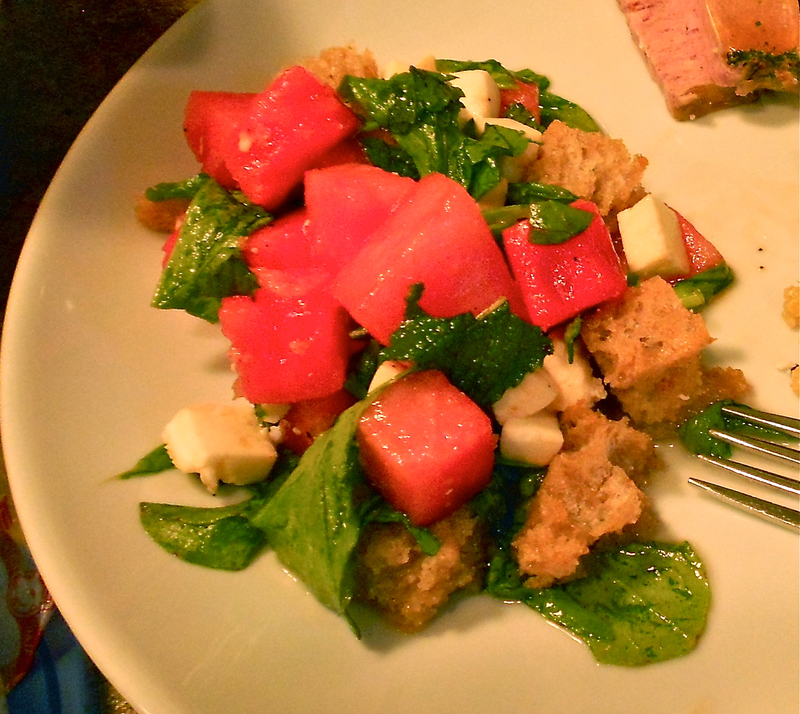 I recalled a watermelon panzanella salad I’d made last year from Dishing Up Oregon (Ashley Gartland, 2011). I put watermelon, mint, and fresh mozzarella cheese on my shopping list. With those ingredients added to the bounty in the fridge I was ready to make another light and summer-filled party salad. This dish could not be easier! I modified the honey-champagne-olive oil vinaigrette by swapping in agave S\syrup. The salad calls for cubed watermelon, shredded rustic bread, chopped mozzarella, 12 fresh mint leaves and a handful or two of arugula. When all this is mixed with the dressing, you drizzle an aged balsamic vinegar over the top before serving. Very tasty and refreshing. Dishing Up Oregon uses recipes from local farmers, producers and restauranteurs. 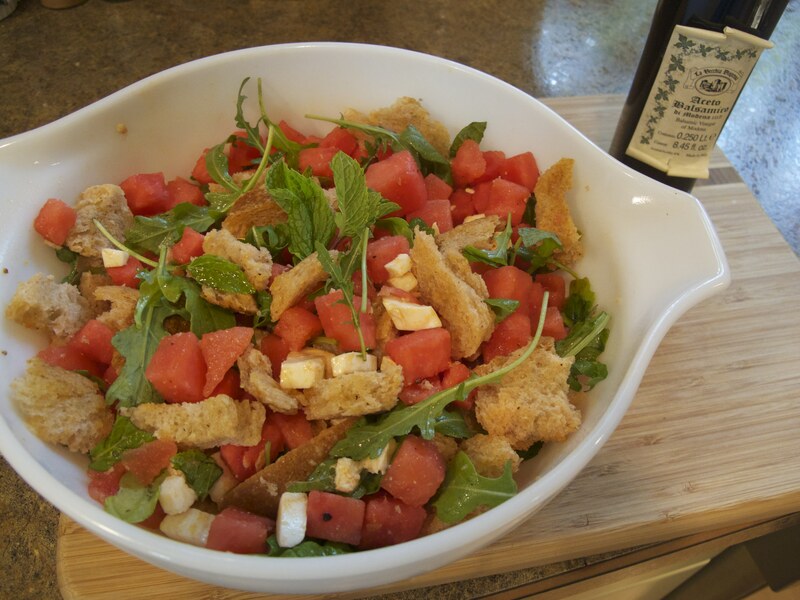 The Watermelon Panzanella features Cooper Mountain Vineyards Aged Balsamic Vinegar. I’ve tasted it, but sadly, had none in my cupboard. I settled for some Aged Modena, which was costly but not spectacular. Elsewhere, the aromatic flavors of Ken and Penny Durant’s Oregon Olive Mill olive oils are used to top a blueberry and lemon cream trifle. This past Spring I had the pleasure of tasting many of their fine olive oils, including some over ice cream. Yumm! These are available more widely in organic markets and Market of Choice in around Oregon. I recently bought their Arbequina Extra Virgin olive oil and it was used in dressings for both of my holiday potluck salads. They also produce a very enticing Blood Orange Flavored Olive Oil which would make any ice cream happier. Hope your 4th of July was safe, healthy and full of summer flavors! Celebrate what you eat!